Although the Dublin Marathon still hasn’t acquired a major sponsor, the Marathon Mission will continue. Jim Aughney, race director of the Marathon Mission, is still at the helm, with the full support of Jim Davis and Teresa McDaid from Athletics Ireland. The story is well known – when the standard of Irish finishers at the Dublin Marathon dropped drastically, Aughney, a more than fair club runner himself, decided to do something. The results over the past five years have been remarkable and, last year, four Irish women made the qualifying mark for the London Olympics, while six men clocked times of under 2 hour 20 minutes. The work continues, and Maria McCambridge, winner of the Dublin Marathon in 2:35.28 last October, will lead a strong Irish entry at the Rotterdam Marathon on April 14. McCambridge had hoped to run cross-country this season, but will now make an attempt at getting under the 2 hour 32 minute time – the Irish qualifying mark for the World Championships in Moscow belatedly announced by Athletics Ireland last week. Other women running in Rotterdam are Barbara Sanchez, Ailish Malone and Claire McCarthy Gibbons, all capable of breaking 2 hrs 40 mins. The IAAF standard for women is a lenient 2 hours 43 minutes, a time broken by five Irish women last year. As for the men, Sean Connolly, who ran 2:16.42 in Rotterdam last year, must run under the Irish qualification mark of 2 hours 11 minutes (see note below) to qualify for Moscow. Only two Irish athletes, John Treacy in 1988 and Mark Carroll in 2002, have ever run under this mark. The IAAF standard for Moscow is 2 hours 17 secs. In winning the national title at Dublin last October, Paul Pollock ran an excellent 2:16.30 and thought his place for Moscow was booked. Now, like McCambridge, he must make a second attempt and has entered London in April. Also running London is Gladys Ganiel O’Neill. Lizzie Lee goes in Paris, while Barry Minnock has opted for Dusseldorf. Breege Connolly, with a 2:40 time from Rotterdam last year, is also aiming for a spring marathon, while Linda Byrne, best of the Irish at the London Olympics, has opted to sit it out until autumn. * Note: Under IAAF rules, countries can nominate six athletes for the marathon although only five can run. Qualification period is 1 Jan 2012-19 Jul 2013. North Sligo’s Mary Cullen set a new course record of 25 mins 55 secs at the Axa Raheny 5. The injury-prone Cullen, who hasn’t raced in over two years, set a blistering pace from the start holding off the challenge of last year’s winner Linda Byrne of DSD who finished second in 26 mins 37 secs. Overall winner of the race was Joe Sweeney of DSD, who was chased hard by Tomas Fitzpatrick of Tallaght and Brian Maher of KCH. A smell of barely dried paint and traces of sawdust greeted competitors at the National Combined Events Indoor Championships at the magnificent new indoor track in Athlone IT. The venue brought out the best in competitors, with Katie O’Donoghue of Craughwell edging out Vivian Fleischer of Celbridge and Kilkenny’s Caitriona Twomey to win the junior women’s title, and Shane Aston of Trim just 23 points clear of Eric Stam from Bandon and Kieran McGinley four points adrift for third of the junior men. Kilkenny’s Michael Bowler, with 11.62 in the shot and 6.11 for the hurdles, was an impressive winner of the senior men’s event. Lizzie Lee of Leevale was first woman at the John Treacy Dungarvan 10 with a time of 57 mins 35 secs. In second place was Claire Gibbons McCarthy of St Finbarr’s in 57.57, with DSD’s Niamh Devlin third in 59.10. Clonliffe’s Gary O’Hanlon was overall race winner in 51 mins 21 secs. Last year’s winners Maria McCambridge and Sean Hehir were non-starters. Linda Byrne and Ava Hutchinson leads a strong Dundrum South Dublin team in the women’s race at Sunday’s European Club Cross-Country Championships in Castellon, Spain. DSD also represents Ireland in the junior women’s race with the team led by Siofra Cleirigh Buttner. 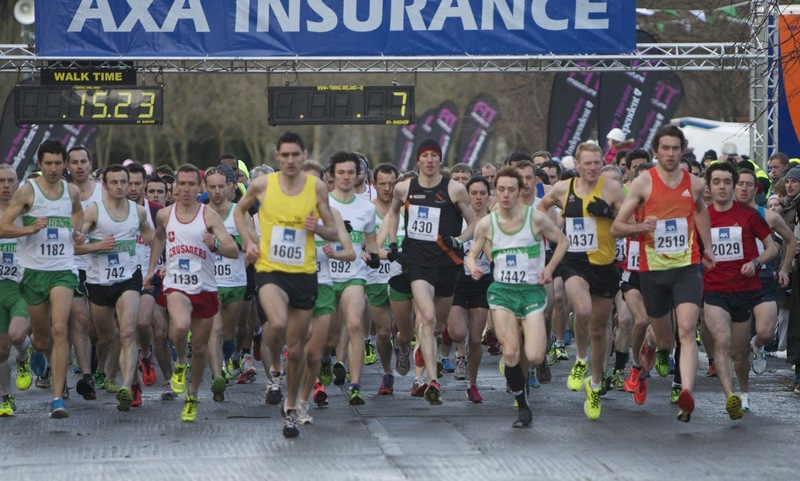 Clonliffe, with a team including stalwarts Sergiu Ciobanu and Gary O’Hanlon, go in the senior men’s race. Derry is the venue on Sunday for the Woodie’s DIY National Masters and Intermediate Cross-Country Championships, with the masters in particular, always a closely contested race. Former champion David Morwood warmed up for the event with victory in the Ulster championships last week, but faces tough opposition from a field of over 200 that is likely to include defending champion Ciaran Doherty and a strong team from Dublin, led by Raheny’s Mick Traynor and former champion Peter Matthews of DSD. In the women’s race, Pauline Curley from Tullamore is the defending champion and will resume battle with her old rival Annette Kealy of Raheny. Star of the Woodie’s DIY AAI Games in Athlone was Clonliffe’s Brian Gregan who set a new personal best time of 46.08 when winning the 400m. The time was a new Irish indoor all comers record. Thomas Barr of Ferrybank was second in 47.46. Ferrybank’s Kelly Proper showed a welcome return to form when she won both the 60m and the long jump. In the women’s 800m, leader Ciara Everard of UCD and then Riocht’s Laura Crowe fell within sight of the line leaving Jana Hartman from Germany the winner in 2:04.14. Raheny’s Siobhan Eviston was second in in 2:04.35 while third was DSD’s Siofra Cleirigh Buttner in a new Irish junior record time of 2:05.26. * Update: UCD’S Ciara Mageean hopes to qualify for the European Indoors at Friday’s Irish University Indoor Championships in Athlone. In Karlsruhe, Germany, Fionnuala Britton is to make an attempt on Mary Cullen’s Irish indoor 3000m record. DSD athletes ventured away from the track and road to make it double at the Hell and Back 10km in and around Kilruddery. Mark Conway was first man and Grace O’Malley first woman. Close to 2,000 registered for the run/assault course.